Tibet Potala Palace | Square led display | verypixel outdoor p10 led screen - Shenzhen Verypixel Optoelectronics Co., Ltd. It is well-known that the Potala Palace is a symbol which highly represent Tibet of China. The Potala Palace Square is just right across the Palace of Potala in Lhasa City, so it becomes the world's highest square. This square is one part of the Potala Palace recognized as world cultural legacy. It is a large square with various modern entertainments, multi-culture and meetings, which is not only an important place for the government of TAR(Tibet Autonomous Region),but also a famous tourist attraction for visitors all over the world. The end of last year, Verypixel wins a bidding of 150sqm Outdoor LED Display Project at the Potala Palace Square with our outstanding and quality product VP-Smartile-O10. As we all know that Tibet specially in a very high altitude and tough environment condition, therefore, the LED Screen should be capable of strong resistance of ultraviolet, hyperbaric atmosphere and low temperatures. The brightness of our VP-Smartile-O10 (Front Service) LED Display is capable of achieving up to 7500cd/sqm and above. A built-in light sensor could be able to brightness adjustment according to the environment, even working under the direct irradiation of light at noon the information could still be seen clearly. In general, machines operating under low temperature will have a very bad impact on some structural components of the display, such as wires or face mask. It might be also affects the internal electronic components, resulting in a decline in the stability of the display and easy to breakdown. 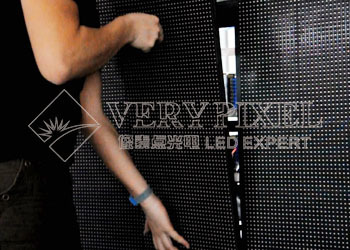 Verypixel holds the philosophy that only offer quality pixel, therefore, we only adopted superior quality in raw materials to make sure every step strictly working in standard procedure, and finally meet satisfaction of our clients with quality LED products. "The perfect combination of Science & Technology and Traditional Culture"
In view of this large LED screen installed at a place with rich endemic and regional culture, therefore, our designers and researchers designed a construction possess the Buddhism features of traditional Tibetan. The whole display designed as a big temple showing with Buddhism relatively images make all the worshipers and tourists praised like waves. In terms of the installation and adjustment, VP front service modules allowing fast assemble & disassemble from front side, which makes the display easy and fast installation. The installation of this LED display screen (about 150sqm) only used 5 days to accomplished. Moreover, The cabinet designed without rear door, which could effectively decline the rates of MTBF under hard weather conditions. The Potala Palace Square Outdoor LED Display is one of the most important developing project of our company this year. You could also take a visit to Lhasa City in person if you like. By the way, if you got much better idea of our products, please feel free to contact us by email to info@verypixel.com.